Some conditions of the ear may cause pain and discomfort. The most common cause is a middle ear infection also known as otitis media. The Eustachian tube runs from the middle of the ear to the back of the throat and has two main functions. It equalises pressure and drains fluid from the middle ear. When the tube becomes swollen or blocked, fluid builds up. Bacteria inside the ear become trapped and begin to grow. This can lead to an ear infection. It usually occurs when the bacteria or virus that causes a sore throat or cold spreads to the Eustachian tube and then the middle ear. Anything that causes swelling or a blockage of the Eustachian tube can trap the bacteria and cause an infection. 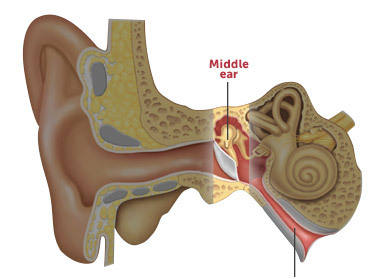 Find out what the symptoms are for ear wax build-up and swimmer’s ear. earclear ear ache relief provides effective relief of ear pain associated with otitis media. It is specially formulated with benzocaine, a local anaesthetic and phenazone, an analgesic, to provide temporary relief of ear pain. 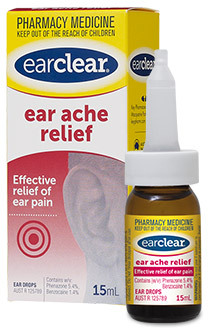 earclear ear ache relief has an easy squeeze dropper to make treating ear pain simple and easy. earclear ear ache relief can be used in conjunction with antibiotics or by itself for relief of ear pain. Babies and children with severe ear ache should be taken to the doctor as soon as possible. Depending on the age and severity the doctor may prescribe antibiotics for ear pain. Ear ache usually resolves spontaneously and as a result antibiotics are not always helpful or necessary. The doctor will decide what the best course of action is for the child. Take children who have a severe ear ache to the doctor as soon as possible. Do not use if the eardrum is perforated or if discharge is present. If irritation occurs or sensitivity develops, discontinue use.